In the years leading up to the finale of Hayate, I spent nearly every week brainstorming legitimate, or at least logical reasons why Nagi and Hayate should end up together. Now that the battle has been won (of course, with no help from me or any other shippers. It was always all in Hata's hands, but it's nice to pretend you had some kind of impact), It's time to take a step back... actually, several steps back. 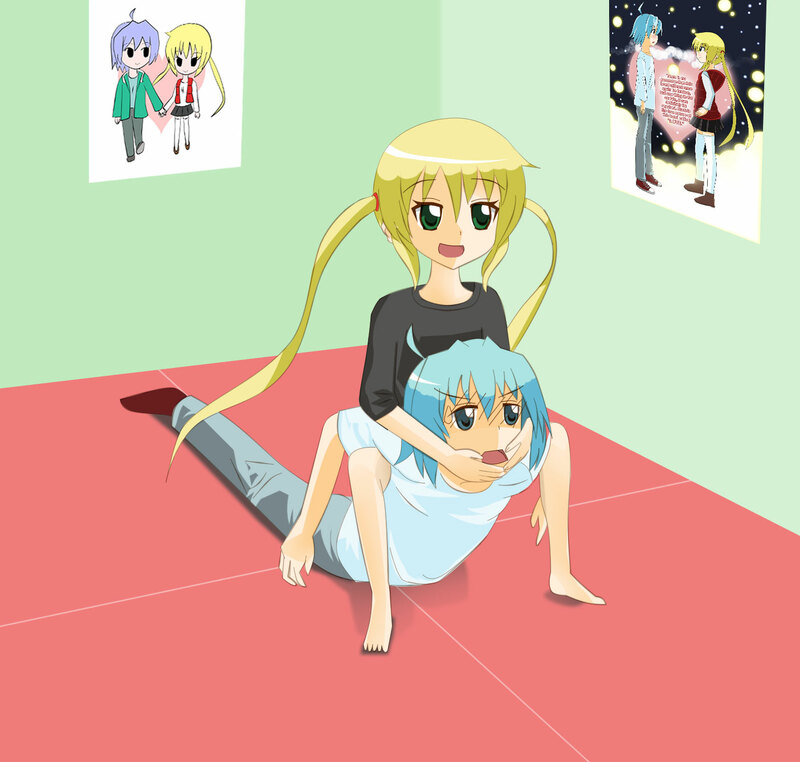 Today, Hayate Reflections examines several silly reasons why Hayate x Nagi should be a thing. While not exactly a silly reason by itself, when you use this as the main basis of your argument -- even in the face of all the real arguments advanced by the other shippers using actual events and implications in the manga, then it becomes silly. As a side note, yes, they do look cute together. Of course, as a serious argument towards them developing a relationship, this is just totally off. Right... coz yellow and blue mesh,therefore, Hayate and Nagi will end up together. Do I even need to expound on this? It's almost as silly as someone pushing this "holy combination of pink and blue," if you know what I mean. Hayate Will End Up With Nagi Because I Read It In A Fanfic! And it was the best fanfic ever! Seriously, the writer is even better than Hata Kenjiro himself. He/she really knows the characters and what emotional depth and romantic development should be! Well... I sure hope that writer was me :D... but seriously though, I've actually seen some people actually use this rationale and think it was actually legit. Ok, this is more of just a pet peeve of mine rather than an actual silly reason. Still, a lot of fans tend to give totally incomplete arguments, half-formed thoughts, or no arguments at all, but simply long clauses held together by ellipses and still think that they have some kind of perfectly good reason. I understand that it can be due to a language barrier at times, but I wish people would be a bit more conscientious about what they write down and at least make sure they can be understood by other people to some degree. Hayate Will Love Nagi Because I Saw It In The Live Action Drama! Oh... you mean that same live action drama where Isumi is a guy or something? ... OK, I BELIEVE YOU! Still... perhaps the endings to the anime as well as the live action drama were at least indications of where the manga was eventually headed. It's just amusing that people kept on chasing shadows of what their girl or the potential of their ship could be when there was very little evidence to support it in the first place in the actual manga based on literary context and using fundamental rules of good storytelling :). Ok, even if you are on my ship, if this is the best reason that you can think of in favor of Hayate x Nagi... please get off my ship right now? Please? I mean, you can pick off several legitimate reasons that Hayate and Nagi should end up together (and they did end up together, so keep crying, haters~) from just a cursory reading of the manga, or even just watching one of the many disjointed anime seasons. Hating on the other characters and using this as leverage to support Hayate x Nagi is not only a silly reason, it's a really horrible one as well. This is pretty silly, but also quite insincere. We all have our biases and I believe it is best to embrace your biases early rather than pretend to be neutral while secretly backing a ship in your head. This is simply hypocrisy. Sigh... no, just no. I for one believe that there is no such thing as neutrality. Our specific experiences have shaped us to have biases towards certain character archetypes and characteristics as well as certain types of stories. I don't believe that there is such a thing as being a multi-shipper. Of course, it could be that you just don't care about the ships at all and enjoy the story for some of its other aspects -- which I believe is legit. If you'll peruse this blog, you'll find that I've written all of my arguments out for Nagi x Hayate and I will definitely write more in favor of my ship in the weeks, months and years to come. With that said, please stop posting about your ship on my blog. They're not welcome here. I won't argue with you. It's moot and academic. Your ship lost and I don't care to discuss about the merits of the story and why your ship would have made for a better story based on whatever sh|t you think would be a good rationale based on your headcanon. Go take that stuff on some other ship like all those salty Athena shippers -- you'll find them out there if you Google a few pages. Also, let me be just as harsh and blunt as possible with you here: YOUR SHIP SUNK! In any case, I'm not discriminating against other shippers lurking or commenting on this blog. Just don't try to re-start any moot arguments with me from now on. I will not give you a detailed response. I'll tell you that it's pointless to argue once. I'll repeat the same statement if you reply, and I'll just delete your entire message if you persist -- so thank you for your consideration and see you next week! She's giving him a loving massage... probably.